The Oase 90 XL is an elegant and graceful waterfall made of robust and non-rusting stainless steel. With the correct flow of water the design ensures a consistent full blade effect with no gaps. The Oase waterfall XL 90 allows entry from either the rear or underside and its 60 mm longer outflow is ideal for installation on walls. Dimensions: 200 x 900 x 100mm (L x W x H), Complete with: stepped hosetail to fit 19, 25, 32 and 38mm hose. Please see the table below for help when choosing the correct pump. 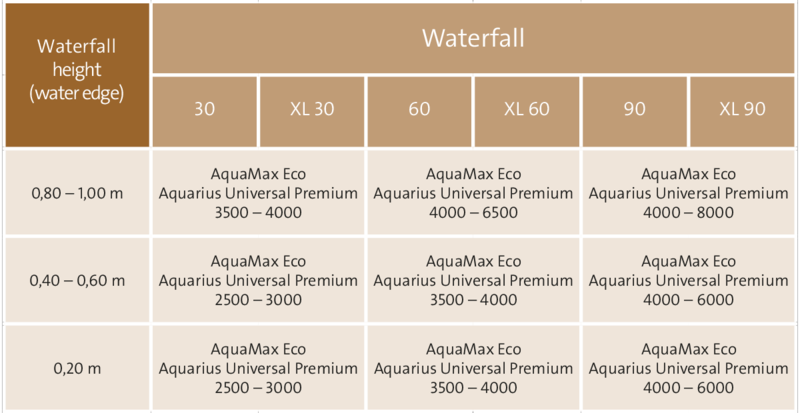 For example if you were fitting a Waterfall 90 XL at a height of 90cm from the water level an Oase Aquamax Eco 6000 or Aquarius Universal Premium 6000 would be most suitable.